Kevin O'Connor had some decisions to make in summer 1987, according to The Los Angeles Times. O'Connor could go pro and sign with the Cubs. He could head to his first-choice college, Cal State Fullerton. He also could wait and follow former Fullerton coach Augie Garrido to Illinois, The Times wrote. "The decision he had to make was really weighing on him," O'Connor's high school coach Bob Ickes told The Times after O'Connor's initial decision to head to Fullerton. "You could tell he was bothered by it." O'Connor eventually did follow his coach to Illinois. He also eventually turned pro. His pro career lasted six seasons. He saw AAA, but not the bigs. 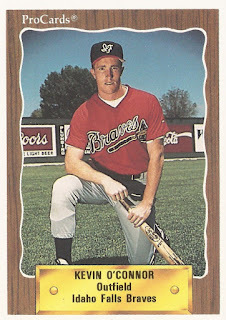 O'Connor's pro career began in 1990, taken by the Braves in the 32nd round of the draft out of Illinois. O'Connor played at Illinois in 1989 and 1990. He hit .319 over his career there. He was also invited to try out for the U.S. national team. With the Braves, O'Connor started with rookie Idaho Falls. He got into 12 games and hit .234. He played 1991 largely at single-A Macon. He also got time at high-A Durham. He hit .240 over 118 games between the two clubs. O'Connor returned to Durham for all of 1992. He singled in the 15th inning of a July game and scored the winning run. He then played 1993 and 1994 at AA Greenville. He hit .272 in 1994. He knocked in a run on a single in an August game. O'Connor made AAA Richmond for 1995. He got into 94 games and hit .222, ending his career.